Poland is the garden gnome capital of the world with its industrious gnome manufacturers producing models for every conceivable taste. JM photo. To Berlin by EasyJet then in fast Jaguar to Poland, first on the autobahn across Brandenberg, then into Poland, once Prussia, now the thriving annex of euroland. After the Oder the road decays into a route rutted by trucks and the misery of Poland is revealed but it is an optimistic misery because for all the problems, this is a country which is plainly on the way up. Forward not backward. And twirling. Up to a point. Poland still has some major problems. The food is not really good and they have yet to understand how to make coffee. The comrades for a long time were effective in keeping these people poor, if not crushing their entrepreneurial spirit altogether. There is the old Prussian architecture, in various states of repair, which can be magnificent, and also a lot of 5-year-plan concrete poured into hideous apartment blocks. Lots of new houses are being built but the construction boom is attenuated because so many of the builders are working in London and there are even some in Normandy. Poles are crazy about praying and the churches are magnificent. No laïcité here. Consumers have not been a priority for some time, although this is changing. Poles are driving quite a lot of smart cars which are easier to get than smart houses. Some cars are brought back as wrecks from western Europe and re-manufactured in Poland, where there are engineers capable of making the cars better than new. There is a weird French-British-Swedish déjà vue about the place because everywhere are the supermarkets Carrefour and Tesco, with Ikea for good measure. They have a beautiful language and especially beautiful alphabet to which I have little access. Look deeper, and everywhere in this part of Poland there is enterprise. Go down the rough road behind someone’s house and you will find a shed humming with machinery. Other clichés are true. The Poles are not just industrious but also fervantly croyant, and their magnificent churches attract a continuous crowd of worshippers – and this is weird – they are both young and old. Unlike France, where those attending mass are old women, mostly, the church in Poland continues to attract a most astonishing following. The services are crowded and people hustle into churches all day and night to say prayers. Spooky! 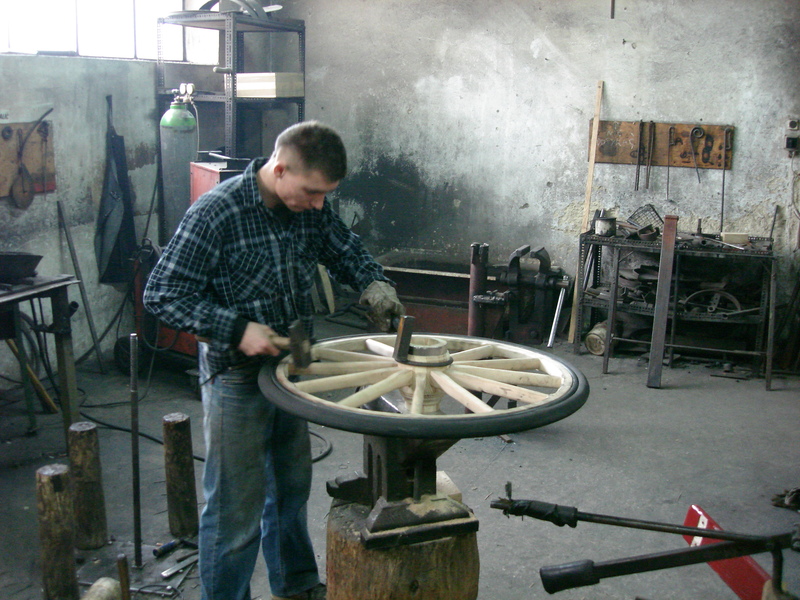 A wheelwright at work. JM photo. It is true some Poles are gloomy. They have a long way to go. They have exported more than a million people to Britain so far, so there has been a loss of talent, it is true. On the other hand, the British connection is starting to work both ways. I have a feeling that Poland has a good long ride upwards ahead of it, as far as consumer comforts are concerned. It is a bit like London, in 1962, even to the smell of coal everywhere. If you know where to look, and I did because of my amazing Norman friends for whom this is the tenth visit, you discover traditional crafts and skills that I find it hard to be imagined can be equalled anywhere, alongside computer-controlled machine tools.